It has taken the wife and I far too long to complete this review. • This is the first project to be released since Aug 30, when measures to cool the property market were announced. 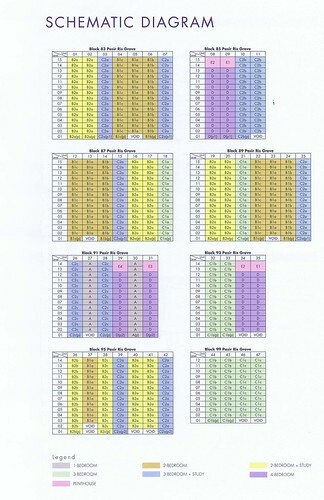 • 250 units were sold within the first week of its preview held about a month ago. • As of last weekend, 358 out of the 400 units released have been sold. • The architects responsible for the design of this project, Architect 61, are the same folks that designed projects like Livia and Ardmore II. 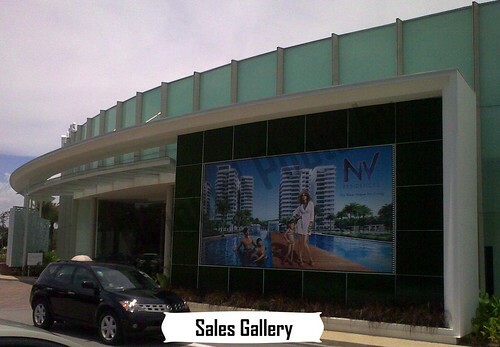 The sales gallery/showflats of NV Residence is located at a plot next to the actual site. 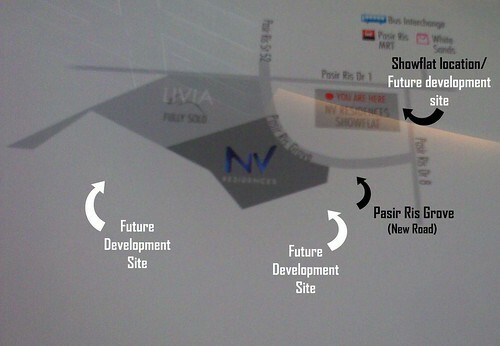 For those who have visited the showflat of Livia previously, the showflat of NV Residences is at the exact same spot. The wife and I understand that besides Livia and NV Residences, there will be 3 other developments that are slated to be built on surrounding plots within the same piece of land. The main entrance of NV Residence will be on Pasir Ris Grove (which is also the address for the project) – this is a new road that will be built to connect Pasir Ris Drive 8 with Pasir Ris Street 52. 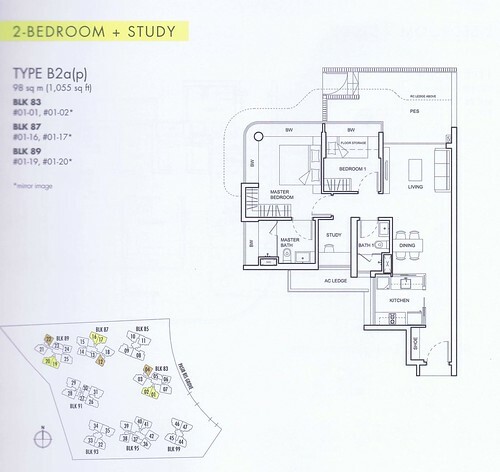 The interior layout of each unit type above the ground floor are quite standard, so you pretty much only need to decide on how many bedrooms you need/want. The facilities at NV Residences are rather typical of those found in most “full facilities” condo projects these days. • The various “themed” swimming pools are lined almost in the shape of a “T” at the centre of the development. 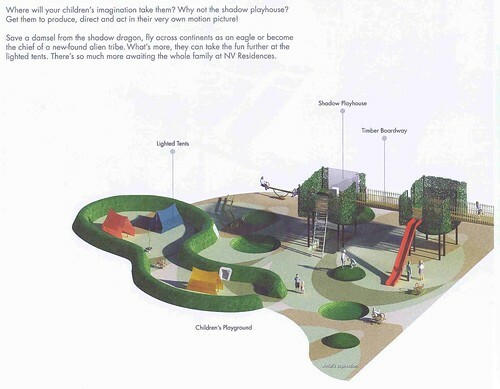 • The children playground, with its shadow playhouses and lighted tents, will definitely be a big draw with kids. Tennis enthusiasts will be pleased to learn that there are two tennis courts within the development. A grand total of 642 parking lots are available within 2 levels (or did we hear it wrong?) of basement parking. So you may have to rethink about buying that second car should you decide to purchase a unit here. 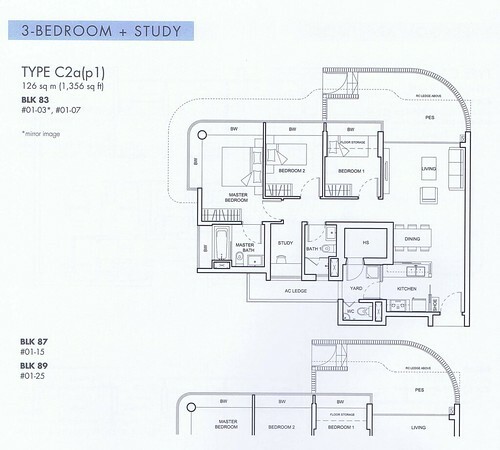 We will focus on the 4-bedroom unit type. As you enter through the main door, a short walkway will lead you into the living/dining room. The developer has included a built-in shoe cabinet on one side of the wall along the walkway, which is a rather thoughtful touch. The living and dining area is rectangular and a tad small. It comes with 60cm x 60cm homogenous tiles (no marble here) and 2.9m high ceiling. The private enclosed space (PES) is rectangular area that takes up about 200sqft of space – we know this for a fact because the 4-bedder on the higher floors is only 1453sqft and does not come with a balcony. But if you fancy outdoor dinning with guests or maybe a private Jacuzzi within the boundaries of your own home (though in plain sight of others), then this ground floor unit is definitely for you. The kitchen is fairly good size and the developer uses short strip ceramic-tile on the floor, which actually come across as rather appealing. The kitchen comes equipped with “Ariston” hob/hood/oven and the cabinets provided have anti-slam mechanism. The wife and I particularly liked the “top half glass/bottom half concrete” wall partition between the kitchen and the living area, which adds a touch of class to the whole apartment and also provides more natural lighting to the kitchen area. There is a small squarish yard area behind the kitchen – separate washer/dryer will have to be stacked one on top of the other. The yard also contains a utility (aka maid’s) room that has enough room for a bed but nothing much else, as well as a small bathroom. The common bathroom is rather spacious and comes furnished with “Hansgrohe” bathroom fittings and the standard standing shower stall. The 2 common bedrooms are decent size and come with bay windows. A unique feature here is that the developer has incorporated a patented “storage solution” in one of the common bedroom. Storage compartments are built flush with the floor or bay window, which allows you to maximize the space in your apartment given the added storage. The wife and I were quite impressed with the idea and thought process that was put into the design. The junior suite is again decent size – you can comfortably fit a Queen bed in here and still have ample space. But we were not impressed with the laminate flooring. The attached bathroom is again good size and comes with similar fittings/furnishings as the common bathroom. The master bedroom is surprisingly huge – the developer has installed a King bed in here and the room still feels very spacious. Bay windows lined across two of the walls forming an L-shape, so you are assured of ample natural lighting. One rather strange thing about the master bedroom is this odd-looking round pillar that stood at the corner of the room, right about where the two rows of bay windows meet. We can only assume that the pillar is for structural purpose, since it does come across as rather ugly aesthetically. The master bathroom is… huge! How else can you have a bath tub and standing shower stall opposite of each other, with the wash basin and WC area separating the two? It is probably one of the bigger (if not biggest) bathroom we have come across in awhile. However, you only get tiles for the walls/floors and not the marble version in many other new projects. Price wise, the 3+Study on the 11th floor (1184sqft) was going at about $877psf, while the 4-bedder on the same floor (1453sqft) was selling at $848psf. However, these prices are more than 2 weeks old. • The design of the unit is well thought-out and functionality seems to be the key. This is evident from the built-in shoe cabinet along the walkway and the “storage solution” found in the common bedroom. Sometimes it is these subtle touches that make a difference, especially if the apartment is small. • All the rooms are regular shaped with no odd corners, which allow for easier maximization of living space. • No balcony for all the “non ground floor” units - the upper floor units only have planter boxes. The wife and I generally find balcony a waste of good liveable space, especially with small apartments. • Two co-ed primary schools within 1-km of NV Residences – Elias and Coral Primary. We reckon many buyers of this mass market development will be families with primary school-going kids. So it is one less headache for those parents who need to put their kids into primary school come 2015. • While the showflat at NV Residences score highly for its design and functionality, the quality of furnishing can certainly be better. Remember the homogenous floor tiles in the living/dining room and laminate flooring in the bedrooms? • Depending on whom you asked, NV Residences is anywhere between 5 to 15-minutes’ walk to Pasir Ris MRT Station and White Sands mall. And the development is also supposedly minutes away from nearby malls such as IKEA, Giant and Courts. However, we feel that NV Residences (together with Livia and the other 3 projects that are slated to be developed) are actually rather isolated. Most of the amenities mentioned are not easily accessible without transport. This is especially if you intend to bring home groceries and shopping. So for those of you who are looking forward to amenities within walking distance from the condo, you may have to contend with the neighbourhood HDB shops across the road. 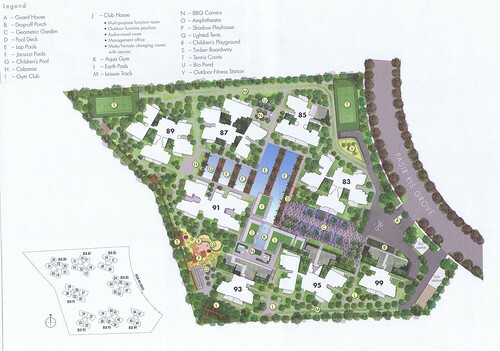 • With Livia and 3 other projects slated to be developed on the same piece of land where NV Residences is sited, one can conservatively say that there will be at least 2500 new apartments next-door to each other once all 5 projects are up and occupied. Granted that it is quite a big piece of land that we are talking about, so one may not get the “sandwiched” feeling despite living so “intimately” amongst 2499 other families. But drivers may need a lot of patience navigating out of the Pasir Ris Grove/Pasir Ris Drive 1/Pasir Ris Drive 8 area especially during the morning rush hour. 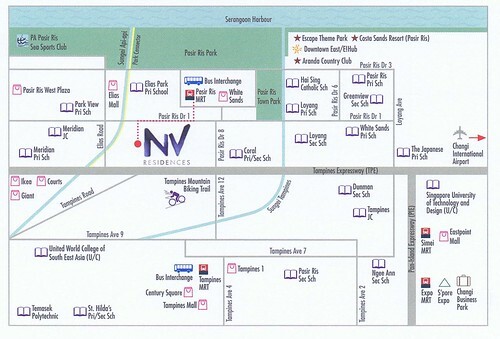 • NV Residences is located far too close to the expressway (TPE) for our comfort. So double-glazed windows may be a good idea especially for folks living in Block 93. • Investors (?! )… although we wonder how many of these still exist given the new government measures. Having said that, most of the units sold so far are the smaller 1- and 2-bedders, so the jury is still out. However, a quick check on the caveats lodged with URA indicate that Livia was still being transacted at the $700 – 850psf price range in Aug/Sep, while Oasis @Elias have been sold at the $650 - $700 range. 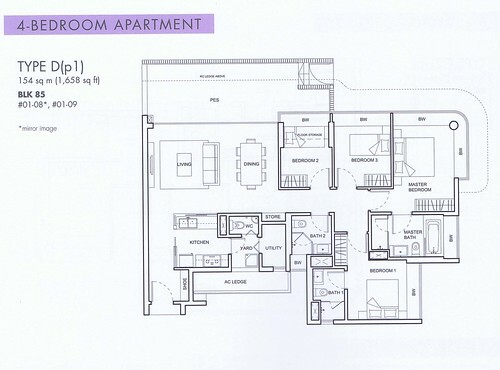 So NV Residences do come across as slightly pricy comparatively. What the wife and I are really looking forward to is the development slated to be built on the current site where the NV Residences sale gallery now stands – this is the best located of the 5 developments (in our humble opinion) and definitely the nearest to the MRT/White Sands by foot. 3 comments to ''NV RESIDENCES (Review)"
Were u aware that the 99yrs of tenure started from Jam 2008? Felt abit short changed abt that part. This affects the 5th development too. just wanted to add - tried walking to nv from pasir ris mrt. by the time i reached the showflat it was already quite a good workout. a 'short' walk claimed by agents is more of a sweaty walk. still need to turn into pasir ris grove..no thanks. definitely not what one would consider 'walking distance' on a daily basis or with ntuc bags.. So far this is the best location.